Nissan has announced a number of new features and design upgrades to the Juke for 2018, enhancing the exterior and interior of the car and sorting out the suspension. 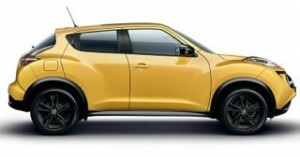 The improvements create a contemporary new look for the Juke’s front end. They include a striking new dark chrome V-motion grille, dark headlamp interior and dark turn indicators on the door mirrors. LED fog lamps are now standard. The Juke has a 354 litres boot with a clever internal design with good space for rear passengers, if a little dark due to the small windows. The Nissan Juke is available in three trim levels, Acenta, BOSE Personal Edition and Tekna . Acenta cars get air-conditioning, 17-inch alloy wheels, a CD player, electric windows, daytime running lights and a tyre pressure monitoring system, Bluetooth and USB connectivity, climate control, steering wheel-mounted controls and tinted rear windows. Opting for the BOSE Personal Edition grade, the Juke comes with the Nissan Connect infotainment system, colour reversing camera, Nissan Intelligent Key with push-button start, electrically folding door mirrors, part-leather seats, automatic headlights and the BOSE Personal sound system which add speakers to the headrest. Top-spec Tekna models add extra luxury with heated leather seats, automatic headlights and wipers, lane departure and blind spot warnings. 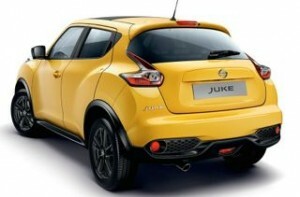 The Engine choice for the Juke is between a 1.6 litre petrol and a 1.5 litre diesel. The 110 bhp Renault shared diesel engine is the choice if fuel economy is your driving force as it offers a claimed economy of 49.6 miles per gallon and there have been no reports of DPF issues as the engine regenerates at lower revs than older diesels, 0-62 in 11.2 seconds proves it has all the torque required. The Petrol option and the only way to have an automatic (CVT) Juke is the 1.6 litre petrol which is a poor performer on the economy front only offering 34.4 miles per gallon. Hopefully the new 1.3 litre engine from the Qashqai is added soon, it needs it to compete.